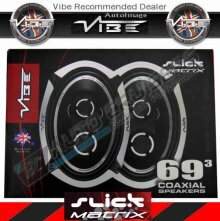 Flying the flag for British audio, VIBE Audio is the UKs number 1 car audio brand and a leading force in the global ICE industry. They are known worldwide for our master craftsmanship and exquisite attention to detail. The speaker cone is finished in satin black and rounded off with alloy CNC detailing on the cone edge, meaning Slick speaker live up to their name, Slick style with Slick Performance. Coaxial speakers have the tweeter built into the cone rather than a separate mountable tweeter and crossover as that of a component kit. The build in PEI tweeter in Slick coaxial speakers offers smoother high frequency response, for better clarity and definition of sound. An easy upgrade, the Slick 69.2 and Slick 69.3 can be installed into a standard parcel shelf. The co-axial Slick 69.2 features a PEI tweeter for extended high frequency; whilst the Slick 69.3 is tri-axial with 2x PEI tweeters to give an even richer, fuller sound. One pair Slick Co-Axial Speakers. Removable rubber boot for magnet protection. Provides rigidity and support for motor and moving parts. Rigid polypropylene woofer cone for smooth, low bass. Provides excellent protection for the speaker. Offers extended low frequency response. Ensures a perfect seal when mounting the speaker. Peak Power: 480 watts- 960w Combined. Min Input: 80 watts RMS. Freq Response: 50 Hz 25 KHz. Mounting Depth: 3 (76 mm). Mounting Diameter: 8.7 x 5.9(220mm x 150mm).